The Universe and the Yarn Gods are both scheming against me. They both want me to fail. The day that I posted about my Stashdown 2012 goals and plans, I got mail. Good mail. Well, what would normally be considered good mail on a day where I wasn't planning on reducing my stash. The mail? Check out the above photo. Oh yes, that's a skein of yarn in a mug. 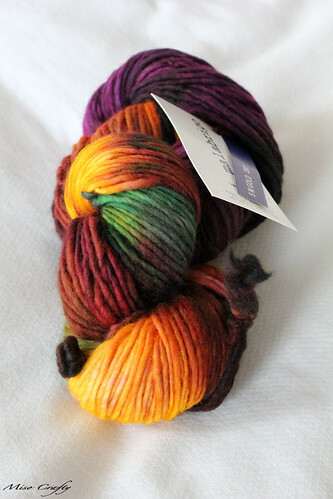 A free skein of yarn. I can't even return it for a refund cause I didn't even buy it. The yarn is a gift. The icing on the cake: see this scratch ticket? That's right. 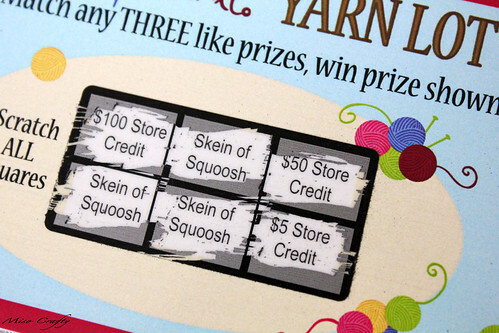 I won a free skein of Squoosh yarn, in any base, any colour of my choice. I won't lie, deep down I'm doing cartwheels of joy cause who can turn down free yarn?? Yummy free yarn at that? Only a freakin' crazy knitter who likes to knit with nothing but Red Heart yarn, that's who. If there is a person out there like that than I would like to meet them, solely so that I could slap them across the face with a skein of cashmere. Oh wait, that's not a punishment! That would be heaven. Ok, I'd slap them with a wet skein of Red Heart. Oh yeah. I could possibly be put in jail for that. Both of these items came from the same company, in the same box. I think I'm being set up for failure here. You want a close up of what the yarn is? That there, my friends, is a beautiful skein of Malabrigo Worsted. What am I going to do with it, I don't know. I have to be truthful here and say I'm not the world's biggest fan of Malabrigo Worsted. As sinfully buttery soft as it is, the single ply of this yarn pills and felts way too easily for my liking. I once had knit a project with this yarn back in my early knitting days and halfway into my scarf I saw that it was looking a little weird. It was starting to felt in the spots that were being handled a little more. Yeah, I wasn't impressed to say the least. Who knows, maybe I should give it another go? I've been eyeing up Veera Välimäki's newest collection, Follow the Lines, which uses nothing but Malabrigo yarns in all four patterns. But you know what that means. I'm going to have to purchase another skein of this stuff if I want to knit any of the patterns. Nice!!! You must share your secrets for getting free yarn gifts in the mail!!! whoa. that's one lucky day you had there! in case you didn't know, turning down free yarn (yarn that's not red heart, i'll give you that) is a criminal offense punishable either by death or a series of terrible, terrible knitting injuries incurred by bob, the patron saint of knitting. so you just enjoy your gorgeous free yarns or else! that is quite the colourway! 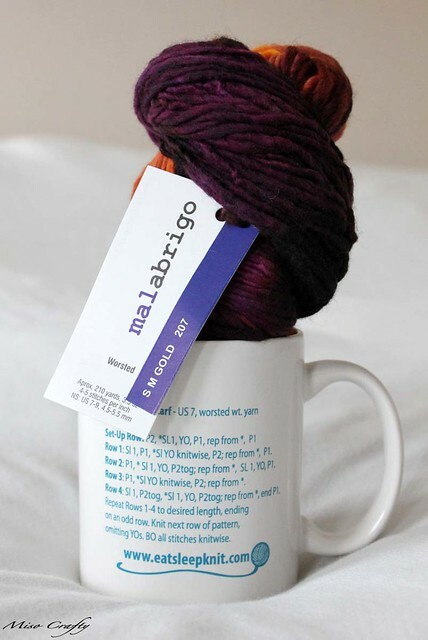 so cool that you got a free mug and a skein of yarn! Those are like two of my favorite things :) There are lots of patterns out there for single skeins of mal... or you could work it with a solid of something else of similar weight (might show off the colours a bit more). I love eat.sleep.knit's scratch cards. They keep me coming back time and time again! There's no secrets...just be a loyal customer and after a while you reap the benefits!